Alter 84 J. u. 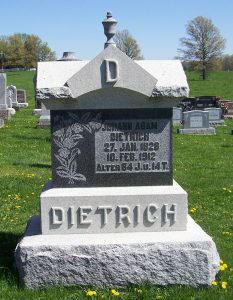 14 T.
Johann “Adam” Dietrich was born 27 January 1828 , the son of Jacob and Mary C. (Werner) Dietrich. According to Zion Schumm’s records Adam was born in Hainstadt, Kreis Erbach, Hesse Darmstadt. He went by the name of Adam, which I will use in the post. Johann “Adam” Dietrich married Maria Germann in Van Wert County on 21 November 1854. Their marriage is not recorded in Zion Schumm’s records so they likely married nearby, at St. Thomas Lutheran Church, where many of the Germanns worshipped. The couple lost several children in the early years of their marriage. Their first son Jacob Dietrich died in infancy in 1857. Two years later, Catharina, one of their twin daughters, died the same day she was born. Their son Wilhelm died in 1863, at just a little over a year of age. Six of their children lived to adulthood. The Adam Dietrich family in 1860: Adam, 32, born in Hesse Darmstadt; Mary E, 27, Hesse Hamburg; Mary M, 1, Ohio; Eserbert Zimmerman, 19, Bavaria; and Margaret Airaman, 15, Ohio. They lived next door to Jacob and Catharine Dietrich. The Adam Dietrich household in 1870, where Adam was a farmer: Adam, 42; Mary, 37; Augustus 7; Magdalene, 11; John, 9; Arnst, 6; Sophia, 3; and Henry, 9 months. The parents were born in Hesse Darmstadt and the children in Ohio. The 1872 plat map of Willshire Township shows that Adam owned 160 acres, the northwest quarter of Section 23. The Adam Dietrich household in 1880: Adam Dietrich, 52; Mary, 47, wife; Mary MM, 21; John, 19; Ernest, 15; Sophia, 13; Henry, 10; Emma, 6. Adam farmed and Mary kept house. The 1886 plat map of Willshire Township shows that Adam owned most of the north half of Section 23, 300 acres. A 20-acre plot in the northeast corner was owned by Magdalene Sauer, likely Adam Dietrich’s daughter, who married Adam Sauer in 1883. Adam’s wife Mary died on 28 November 1888 and is buried in Zion Schumm’s cemetery. 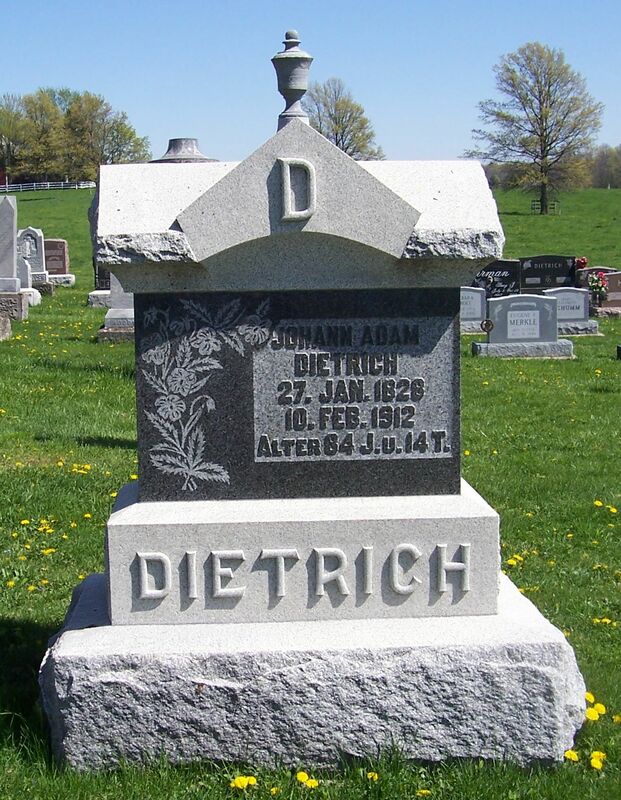 Adam Dietrich died less than two years later, on 10 February 1912, from an infection caused by a bowel obstruction he had had for 30 days. He was 84 years and 14 days old. 84 years and 12 days according to his death certificate. He was buried on the 12th and Buchanan was in charge of the arrangements. His son Henry was the informant for the information on his death certificate. Adam‘s funeral text was from the first chapter of 1 John. According to Zion Schumm’s records he was survived by 4 children, 11 grandchildren, 3 child relatives through marriage, 2 brothers-in-law, and 1 sister-in-law. Adam Dietrich’s date of birth is given as 27 Jan 1828 on his death certificate, Zion Schumm’s records, and his tombstone. Sutton, History of Van Wert and Mercer Counties, Ohio, (1882; reprint, Mt. Vernon, Indiana : Windmill Publications, Inc., 1991), 257. 1840 U.S. Census, Willshire, Van Wert, Ohio, p. 70, line 15, Jacob Tudrich; digital image by subscription, Ancestry.com (https://search.ancestry.com/search/db.aspx?htx=List&dbid=8057&offerid=0%3a7858%3a0 : viewed 14 Jan 2019). 1850 U.S. Census, Willshire, Van Wert, Ohio, p.172 (stamped), p.343 (penned), dwelling 357, family 376, Jacob Detrick; digital image by subscription, Ancestry.com (https://search.ancestry.com/search/db.aspx?htx=List&dbid=8054&offerid=0%3a7858%3a0 : viewed 14 Jan 2019). “Ohio Marriages, 1800-1958,” database, FamilySearch.org, Adam Detrick & Mary Elizabeth Germann, 21 Nov 1854, Van Wert, Ohio. 1860 U.S. Census, Willshire, Van Wert, Ohio, p: 151 (penned), dwelling 1075, family 1069, Adam Dertrich; digital image by subscription, Ancestry.com (https://search.ancestry.com/search/db.aspx?htx=List&dbid=7667&offerid=0%3a7858%3a0 : viewed 4 Jan 2019). 1910 U.S. Census, Willshire, Van Wert, Ohio, ED 114, p258 (stamped), dwelling 115, family 116, Adam Dietorch; digital image by subscription, Ancestry.com (https://search.ancestry.com/search/db.aspx?htx=List&dbid=7884&offerid=0%3a7858%3a0 : viewed 14 Jan 2019).